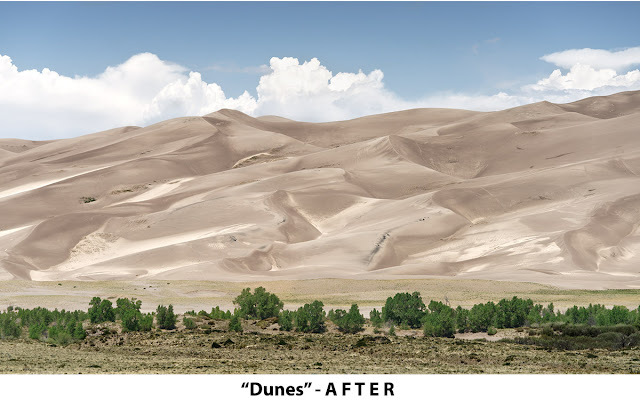 The dunes in Great Sand Dunes National Park in southern Colorado are as tall as 750 feet (230 meters) - the tallest sand dunes in the United States. My wife and I visited on a sunny (and thankfully not too hot) day in early June and spent a couple of hours climbing and exploring. It is a magnificent place. Early morning would have been the best time for photography. 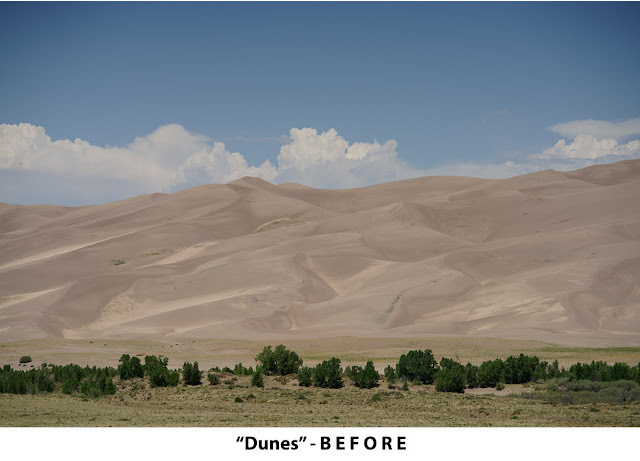 Low-angle light would have accentuated the textures and contours of the dunes. But we arrived around noon when the light was flat, as you can see from the unprocessed "before" photograph which was also underexposed. You can't be everywhere at the best possible time for photography - the only option is to make the best of what is available. Through adjustments for contrast and exposure, I was able to bring out detail in the dunes even though the light was flat, and I compensated for having underexposed the original shot. I also cropped the image and changed the aspect ratio, elongating the image. This accomplished two things: it eliminated most of the blank sky at the top of the frame that added nothing to the image; and it accentuated the vastness of the dunes.